I left school at Christmas 1954 and started work at a company manufacturing suitcases called S Noton Ltd at Endurance Works on Forest Road – the original A-E-C works which many years later became the home of Merchandise Transport after Ferry Lane closed – we did in my time (1956-1957) find a number of old General engines in the cellar below the works. 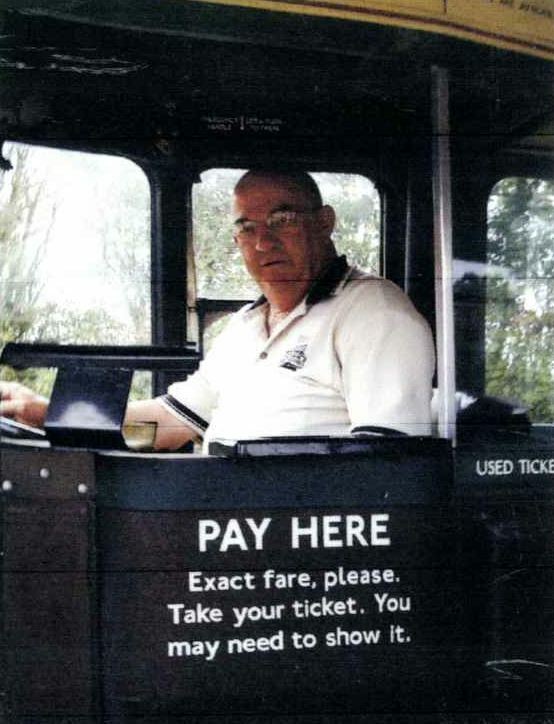 I left Noton’s and went to work for the Eastern National Bus Company at their garage in Wood Green on the 251 road to and from Southend, I started as a conductor and finished as driver. 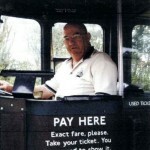 I wanted long distance driving and one of my neighbours was a Lebus driver – Terry Cornell who was on Merchandise, mainly Scotch, we were both members of the Walthamstow Trades Hall up in Hoe Street by the Bell Corner in Walthamstow, we talked about getting me a job at Lebus as a driver in 1961. I went down for an interview upstairs in the office with Percy Mounteer who was the transport manager at that time and I was given a start, I thought that I would be out on the road straight away but along with several new drivers like myself we were kept on the loading bays for roughly two months to learn the art of loading furniture and handling furniture without doing any damage. The loader that taught me the game was a guy by the name of George Emms who was a good fast loader. The yard foreman in charge of all the drivers was Bill Death (correct spelling!) and Charlie Chazalon (known by us as CHAS) as his shunter and gofer. 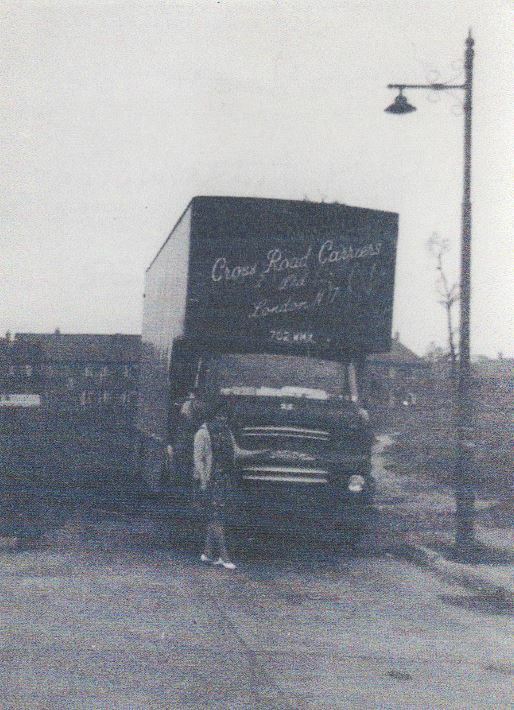 The two bays (1 and 2) from the gate were the Irish bays with their Bedford units, two S TYPES, one TK and six trailers with Scammel couplings (three in Merchandise grey a three in Curran Transport of Northern Ireland in blue), a Merchandise driver would run them up to Preston Docks swap trailers which would be loaded onto a ferry for shipment and Curran would collect them in Larne to deliver all over Ireland, that job ran seven days a week. The last two bays were for Merchandise which was all goods to be carried on A licence and Johnny Noble was in charge, he would put part loads onto a part load of Lebus furniture, the loads could be anything from more furniture to paper for Gestener to tyres. Johnny used to check each load to try to get some of his Merchandise onto each A licence truck, they never ran with half a load hence the tailboard loads. As far as I can remember the A licences were bought from Charlie Dormer who ran a lot of eight legger tankers painted green and some furniture vans out of Balls Pond Road by Dalston Junction and at one time Lebus did try to get the whole fleet of trucks on C licence transferred to the A licence but there were so many objections that they lost the application in the licencing court and it was refused. Lebus had a bedding factory by the name of Eventide who were down in the city somewhere near Goswell Road and in my later DH Transport days I did do quite a few loads out of there. Eventide also had a small fleet of TK Bedfords on C licence. 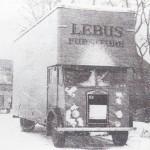 Lebus also had the soft furnishing factory out in Woodley near Reading, a sawmill and forest close by, they also ran C licence fleet and we all used to meet up in various parts of the country. The fleet on Merchandise consisted of TK Bedfords on A licence numbers CXD 901 to CXD 912 mainly on Scotch and more that I cannot remember, the big Bedford Coronets a coach built cab numbers XXF 701 to XXF 712 mainly on Lancashire work, XXF 707 was in the film of the Great Train Robbery where Ronnie Biggs escapes over the wall from prison through the trucks roof into the body. Albion Victors just two that I can remember XYO 17 and XYO 18 on mainly Scotch. There were many more of which I cannot remember. Lebus had a large fleet on C licences, small TKs, small Coronets, Bedfords, Albion Chieftans and some petrol O type Bedfords. 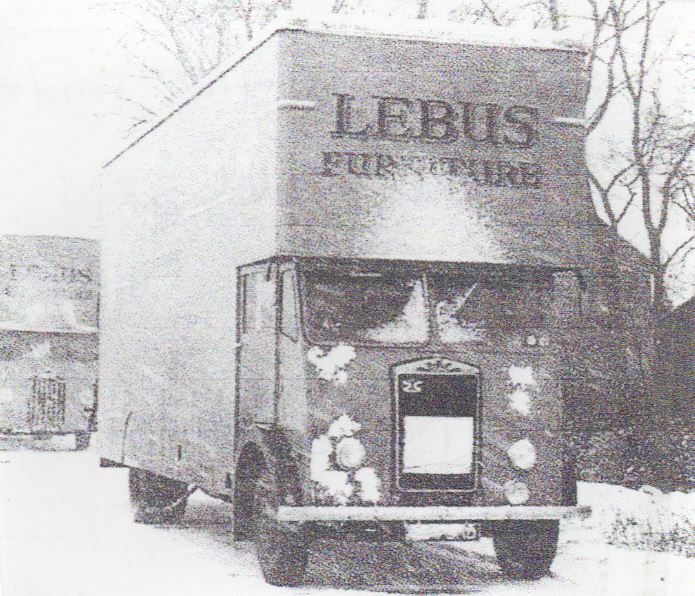 Lebus also employed two furniture carriers from Derby who were Porter and Keeling, they did most of the Midlands work. Some names of drivers that I remember – Kit King, Sid Smith from Aberdeen, Alfie Broomhead and Fred Forrest (general manager). When I did get onto the road I was given a petrol Bedford number 604 —- with a huge Luton and it was a monster which rolled if you took a corner to fast and my first trip was down to Sheerness on the Isle of Sheppey. Later I was given an S type Bedford diesel number 829 ALM and my first trip was two of us going down to the far west of Cornwall with all stations from Bodmin down to Penzance and running down on Sunday. After a reasonable time I eventually got onto Merchandise with CXD 908 and ran with the big boys up into Scotland and Manchester, we used to return load from Metal Containers in Ellesmere Port, Robbicans in Hull, Metal Bok all over, India Tyres in Inchinan, Murphy Richards in Dundee, Tricity Cookers in Spennymoor Durham, Merchandise Transport in Lancashire, London Road Glasgow and many more companies. Most of the new bodies were built by Bonalack and were good solid bodies that took a lot of hard work. I eventually left Lebus and went over to DH Transport on Ferry Lane but I was still in and out of Lebus doing a lot of their A licence work such as a complete house removal down to St Agnes in Cornwall and to places that they did not want to send a truck like the Far North of Scotland, Devon, Cornwall and North Wales. 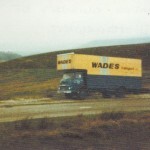 Sam Harris was the transport manager and young Ted Wade was the guvnor, My first truck on DH was an Albion Chieftan 733 RMV, then an Albion Victor 702 WMX. Then a brand new TK Bedford number DMV 689A. I finished up with a Commer OLB 430E. By this time I was away from home for weeks at a time and my wife was starting to get a little bit fed up with my roving life so I gave it up. More of Michael’s memories as a professional driver are available on the Red RF website. Ah this brings back long lost and great memories; my Dad Bill Freeman drove XXF705, my uncle Tom Freeman drove XXF 706 and Phil Cook drove XXF 704 in those halcyone days delvieing funrtitue all over Lancashire and in my Dads case north Wales too. Some of the names you note I recall as a young fella going to Ferry LAne with my Dad and another uncle Freddie Britten, His daughter Barbara Groom worked in the Account Section at Lebus. 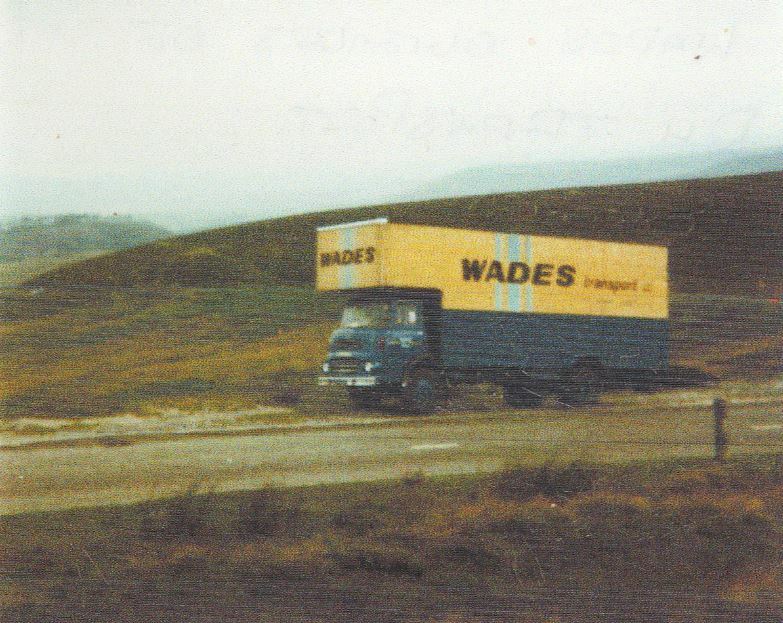 Dad went on to work at Wades Transport for some years who were based in Sherboro Road, Tottenhan buit shared a warehouse in Ferry Lane opposite D&H Transport. great photos here of the lorries especially the old Albions with their strange gear shift sand the red buttons on the handles!! 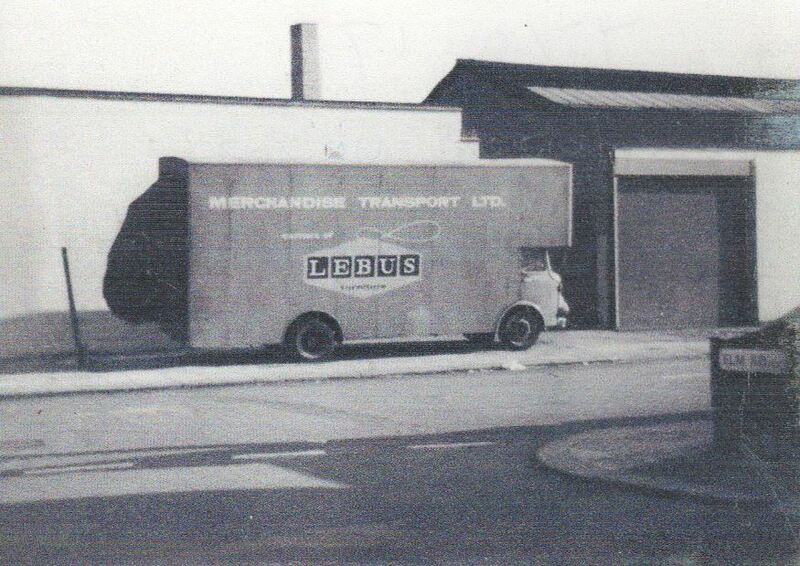 I found this article very interesting as it told me much of the history of the Lebus transport operations before I arrived on the scene in 1973. Nobody there spoke much of the “old” days at Tottenham although most of the men operating the transport were Tottenham men.Two names you mention were still at Lebus when it moved to Walthamstow and were not made redundant until production moved to Halifax in 1980. They were Ron (Chas) Chazalon (who I believe was a french canadian of Russian origin) and Johnny Noble . I believe he moved to Norfolk and became a postman. Driver Sid Smith from Scotland transferred with me to the Halifax operation until we were both made redundent in March 1981 a few weeks before the company finally collapsed. My daughter, who was only 10 at the time and often travelled with me on my runs, remembers that Sid used to call her the “Wee Bairn”. 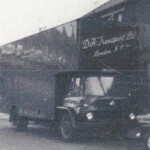 We still had several TK Bedfords from Tottenham in use at Walthamstow numbered in the OLN***E series. The rest of the fleet were year numbered C,G,H and J. All were TK Bedfords except for one Ford D-series. We also had a strange Bedford with the rear axle set almost at the back of the body. It was sign written with adverts for Lebus Europa and was always known as the show van. All of these were retired in 1978. Now that I have retired from driving after 45 years on the road I do charity work for a furniture recycling project. We often receive furniture made by Harris Lebus, much of it prewar but also some from the 50’s and 60’s. So far I have not seen any from the 1970’s that where made at Walthamstow while I worked there. I hope that doesn’t reflect on the quality of the furniture made in later years. We recently received a Lebus Link Wardrobe and dressing table from late 50’s early 60’s in very good condition. Look on my Facebook timeline. Martyn.Brisland for a picture of it. Any Offers? Don’t know what made me search for Harris Lebus but the read brought back memories and was very interesting. Michael Parsons mentioned the Scottish Connections, Glasgow depot, Sid Smith etc all of these being very familiar to me. To explain my father Joseph Sloan was a driver with Lebus having moved there from Ralstons of Milngavie. 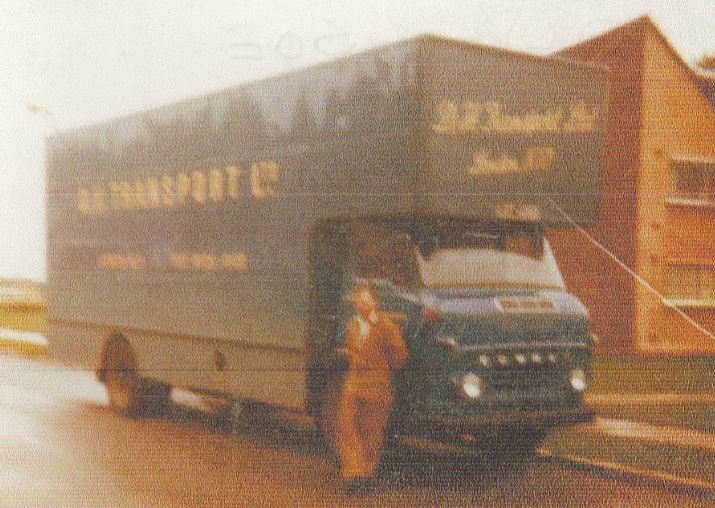 In the very early 60s we re-located from Penrith to Bellshill when Joe came off the road to take up a staff position in the London Road Depot of Merchandise Transport. 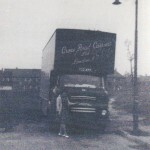 My fathers younger brother Jim Sloan was transport manager with Glenroy Transport when Merchandise took them over and they worked together in Glasgow until made redundant in 1971. Michael’s mention of Morphy Richards, India Tyres etc are all familiar as I frequently went with various drivers to load up at these facilities. The Glenroy vans had another regular run taking steel mesh dustbins from Levin (Fife) to the new towns being built in England. As far as I know the drivers used casual labour to help with the deliveries. I have some photographs of Lebus vans on the pull in (parking area) of the Becon Cafe (Penrith) which was run by my mother and her sisters and one of a group of the Scots Lads in a pub in Tottenham which I can scan & post. Thanks for jogging my memory as regards to Lebus, young Albert McMillian when he was learning the art of driving Lebus lorries lived down in East Anglia with the driver that did that area who was teaching Albert to drive and whose name I cannot remember but the name Bobby comes to mind. Albert’s father Ike was still at home in Scotland on his normal one trip up and down each week, on one trip I had come down with a load of 26 drops of fridges for the south coast and Bill Death sent Albert out with me to clear the load as he wanted the lorry back for the next trip. Albert and myself spent two days delivering these fridges from Southsea along to Hastings to clear this load and we had a very pleasant night out in Brighton with a few beer’s and a Chinese, as Albert had not passed his test at this time he could not drive but I found him to be a very pleasant lad and it was quite a fun return load. I look foreword to seeing your photographs of those days of long ago to see if I do remember a few of the old faces and if I do I will pass on the info. Iwas driving an 8 legger for Lambert Bros Bicker about 1956, and can recall one of LEBUS JENSONS in a head on collision killing both drivers just south of Alconbury, can you recall that incident ? and remembers many of the people mentioned, in particular bill death who would be shouting at the drivers to get loaded and get off up the road! iam writing on behalf of my dad as he is not as yet computer savvi! I thought that it would be nice to remember some history of the drivers work week on LEBUS/ MERCANDISE TRANSPORT. 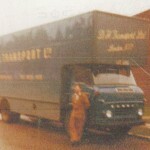 It would start on a Saturday morning by loading for the North East Coast with 23 drops, once loaded it was away home with the lorry for a Sunday morning start, possible it would be a night out with the family for a beer or two but Sunday it was up a light breakfast and away by about 1100. A crowd of us would meet up at Alconbury Cross for dinner at about 1300 and after we would proceed up the A1 with as we got further north the convoy would get slowly shorter as all the drivers went onto the routes that they were going to deliver. I was going to North Lodge Terrace Darlington for my digs some went up to Gateshead for Eastern Scotch, into Leeds for Yorkshire and up to the A66 for Western Scotch. I would probably have a pint and a Chinese and back to my digs, the following morning after a good breakfast I would make a start in Darlington then onto Stockton,Middleborough, Sunderland and back to Darlington for the night, I would probably be left with three drops for the Tuesday morning and than into Spennymore for a load of Tricity Cookers for Enfield with a bit if luck I would get down to Long Bennington to the good digs for that night. A good start the following morning to tip in Enfield and reload in the warehouse for Thursday morning which could be six drops in North Wales starting in LLANDUDNO and right along the coast to BANGOR which I would do the most of by Friday dinner then into Metal Containers Ltd in Ellesmere Port for a load of drums for South London which I would tip early Saturday morning. I would get back to the yard to reload for Glasgow and the week would start again. Leave Sunday morning meet up in Alconbury for dinner then up to the A66 at Scotch Corner and stop at the George Public House in Brough, early start Monday morning to be in Glasgow by 0900,stop in the digs in London Road. Early closing on Tuesday so 20 or more drops must be done by then to get over to Inchinnan for a load of tyres for Brighton. Stop in the transport digs in London Road which was just a couple of miles towards Glasgow from Merchandise Transport Glasgow depot. Run from Glasgow down to Brighton, tip the tyres on Friday morning run back to London and home reload Saturday morning to go back up north on Sunday morning. It was a busy life and furniture could be hard work you could get to a shop such as the Times Furniture in Manchester to be told to take it down to their warehouse over near Stockport or Callers of Newcastle upon Tyne would do the same thing and go to their warehouse in Strawberry Place it could be frustrating but that was the job, if I had my time again I would drive every mile again and do most not all of the drops. In those far of days we did work seven days a week and pull all sorts of strokes that would not be allowed in this present day with all this modern digital taco’s and trucks. I hope that you enjoy this article from somewhere in the region of fifty five years ago I know that I enjoyed drifting back all those years ago and remembering those drivers that I would imagine have all gone by now. Michael Parsons ex Lebus,DH Transport,LT,CWS,Coopertive,Hays,Wincanton,Waitrose and a few more that I cannot remember. 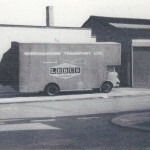 Hi any one that has an interest in the Lebus/Merchandise Transport fleet,having been in road transport for 51 years in the UK I curious as to what happened to the fleet of lorries, there were a few different makes such as Albion,Bedfords,Fords,Jensons and even A.E.Cs. I guessed the total to be about 160/170 vehicles, in the run down of the Lebus empire what was the fate of all of the vehicles were they scrapped by a vehicle breaker,sold on to a company like Pickfords or any other furniture company,sold and sent abroad or standing in a remote yard falling apart such as the Albion[not Lebus] behind the doctors surgary in Silloth Cumbria. The only one I have found is one of the XXFs which was used in the film Robbery and then disappeared completely, as far as I know none of the fleet was preserved there would have been a lot of steel,aluminum and spare diesel engines.I have looked a couple of scrape yards via You Tube but plenty of vehicles but no Lebus so any answers, from an ex Lebus driver Michael Parsons.